Most of us think of Orlando has the theme park capitol of the world—and for good reason! Home to the world’s renowned theme parks, Orlando has become one of the biggest tourist destinations on the planet. But if you don’t want to deal with crowds and long lines, Orlando has plenty of other family-friendly activities, too. The driving range gets high-tech (and highly competitive) at Topgolf, where players whack golf balls at point-assigned targets from a towering, four-story driving bay. One to six people can play at any given time, but the player who can hit the most targets is named champion. Topgolf’s swanky features make it feel less like a sporting venue and more like a super fun, outdoor arcade. Its driving bays are climate-controlled, so you can stay cool during Orlando’s brutal summers and warm during its chillier winters, and the kitchen offers some delicious bar eats, as well as beer, wine, and cocktails—for the parents, of course. The facility doesn’t have any age restrictions, but management does request that anyone under age 16 has adult supervision after 9 p.m. Located in the hip Mills 50 district of Orlando, the Orlando Science Center offers countless exhibits, educational courses, movie screenings (in both standard and 3D), and engaging activities for all ages—not to mention, it’s an ideal way to escape Orlando’s heat and rain. What’s more, the newly designed KidsTown at the Orlando Science Center boasts a whopping 11,000 square feet of hands-on, skill-based activities for kids aged 7 and under. There, kids are encouraged to explore, build, and test, so they can create their own experiences. Obviously, we can’t round up kid-friendly activities in Orlando without mentioning its world-famous theme parks. If you can brave the crowds, the I-4 corridor (one of Orlando’s main roads) is chock full of theme parks, including Walt Disney World, Epcot, Animal Kingdom, Universal Studios, and Universal’s Volcano Bay, among others. 1. Plan your trip far in advance, so you can snag the best deals on accommodations and activities. 2. Arrive at the theme park as early as possible. Most hit capacity before noon and will close their gates to guests. 3. Visit the parks during the off-season or during the week. You’ll find the biggest crowds during school holidays (think Thanksgiving, Christmas, or spring break) and on weekends. If you want the House of Mouse experience—without the long lines and big price tags—check out nearby Disney Springs where you’ll find lots of themed restaurants and bars, as well as shopping and entertainment. What, exactly, is WhirlyBall? Imagine a combination of basketball, hockey, and jai-alai that’s played while riding in a bumper car. Here’s how it works: Teams of five-on-five use hand-held nets to chuck a ball at an elevated target—all while getting bumped around by their competitors’ bumper cars. Yep, it’s totally as fun—and difficult—as it sounds. WhirlyDome also offers laser tag, arcade games, and a full-service kitchen and bar, so you can rest and recover after an intense game of WhirlyBall. Your kids can channel their inner-Tarzan at Tree Trek Adventure Park, the largest zip-line and ropes course in Orlando. Set on 15 acres of natural pine forest, Tree Trek offers 97 courses for aerial artistes to climb rope ladders, cross wobbly bridges, swing on Tarzan ropes, and leap onto suspended nets. You’ll also find two totally separate kids’ courses with 21 kid-friendlier challenges. We know what you’re thinking, but don’t worry—Tree Trek takes every possible measure to ensure their safety of their guests. Before hitting the ropes, participants are outfitted with all of the necessary safety gear, and partnered up with a trained safety guide. 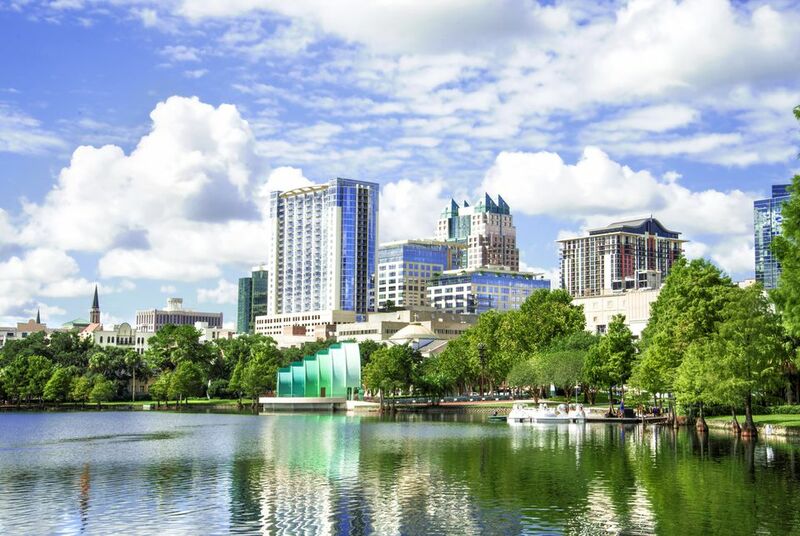 Many people don’t realize that Orlando is totally land-locked, but the city (and its surrounding areas) boast hundreds of gorgeous, recreation-quality lakes for boating, waterskiing, paddle boarding, swimming, and kayaking. If you’re looking for a fun way to get out on the water, don’t miss Winter Park’s Scenic Boat Tour. The tour’s 18-passenger pontoon boats take guests through the beautiful Winter Park chain of lakes, where you’ll peep ancient oak trees and Spanish moss, massive, water-front mansions, and some local wildlife (fear not: There aren’t any alligators in these waters). The Harry P. Leu Gardens, located in Orlando’s Audubon Park district, contain nearly 50 acres of tropical and semi-tropical gardens, as well as walking trails, lake access points, and open spaces for your kids to burn off a little bit of energy. Leu Gardens hosts kid-friendly events year-round—like art exhibits, concerts, story time, and outdoor movie nights—so don’t forget to check out the events calendar before your visit. The best part? Most of Leu Gardens’ events cost less than $10 or are totally free to the public. If you have animal lovers in your family, a trip to the Central Florida Zoo will definitely not disappoint. From Florida black bears, to clouded leopards, to two-toed sloths, your kids can get up close and personal with some of nature’s most amazing animals. The Central Florida Zoo offers lots of other activities, too, like giraffe feeding, rhinoceros encounters (you’ll get to meet a rhino named PJ! ), an in-house waterpark, and a beloved mini-theme park called Bungee Bounce, where kids can soar through the air—attached to a bungee cord, of course—and walk on water in transparent bubbles called WOW Balls. Basically a kid’s dream day, right? Lake Eola Park, located in the heart of downtown, is home to farmers markets, concerts, art exhibits, and other events year-round. But our absolute favorite thing about Lake Eola? You can rent swan-shaped paddle boats to cruise around the lake and soak in the scenery. Each swan boat can accommodate five people—including doggies!—so the whole family can enjoy the ride. It costs around $15 for a 30-minute rental, but there are always coupons for discounted rides. Be on the lookout for deals ahead of your trip! Offering 35,000 square feet of “edu-tainment,” Wonder Works is an indoor amusement park that challenges the mind and body, and encourages kids to get creative with its 100 hands-on exhibits. Located on Orlando’s International Drive, Wonder Works is super close to other major Orlando-area attractions and accommodations. Wonder Works is divided into six distinct “zones,” in which kids can explore and experiment with space, light and sound, and weather, or check out the imagination labs, physical challenges, and art galleries. Get in touch with Mother Nature—and central Florida’s flora and fauna—by taking your kids on a guided eco-tour of Orlando’s Grande Lakes. You can explore the waterway by renting a pedal boat or kayak, or join a Master Naturalist on a guided tour. If you don’t want to get on the water, Grande Lakes also offers guided safari tours in all-terrain golf carts! What could be more fun than an entire afternoon of bouncing on trampolines, completing obstacle courses, and climbing on trampoline-based jungle gyms? Literally nothing. Airheads Adventure Arena is, essentially, a kid’s dream attraction. Did we mention Airheads also offers video games and pizza? This indoor trampoline park is fun, affordable, and most importantly, super safe. The staff at Airheads takes extra care to ensure your family’s safety as you bounce the day away.